Jonathan's Diamond Buyer - What's Your DIamond Worth? You are here: Home / Uncategorized / Yo, Diamond Buyer, What’s My Diamond Worth? Yo, Diamond Buyer, What’s My Diamond Worth? I often get asked what I will pay for diamonds, and to be perfectly honest, this is not a question I can answer with 100% certainty without seeing the diamond first. This is also a question that gets asked to me at least 50 times a day because my business is not just based in Houston. Is Your Diamond Worth a Trip to Houston? First, let me make it very clear that I never put a value on anything without seeing it with my own two eyes and having it in my big ham hands. Any diamond buyer who will give you a price for your diamond or jewelry without seeing it is not a diamond buyer that you should trust. Second, there is only so much you can see with a photo or even from reading a GIA or EGL certificate, so here are a few things that I will look for when you send me a picture before I will even decide if it is worth your time and mine to have you send the diamond to me. From the picture how does the diamond look? What is the cut of the diamond? What is the color and the carat weight? Is it a signed piece by a designer? Does the piece come with a certificate and where is that certificate from? Your Diamond Is Going on a Jet Plane! 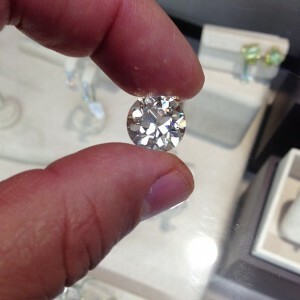 If your diamond is something that I am interested in, then we arrange to get it to Houston so I can take a look at it. Once it gets here, I have a new set of criteria that I place on each piece before I ever put a price on the item. Is it worth more in the setting or out of the setting? This is determined by whether or not it was bought at a place like Tiffany & Company or BlueNile. This is also determined on the year of the setting. If your diamond is set in an antique platinum setting that is one of a kind, then it is worth more in the setting because of the uniqueness of the setting. After looking at the diamond in the setting, I always take the diamond out of the setting. All diamond buyers who know what they are doing will do this. If I don’t buy the diamond, then I reset it and send it back to you, but this is the only way to truly see the entire stone. I look at your diamond under my loupe and under my microscope to see the imperfections, check for chips and cracks, inclusions, has the diamond been treated and to see if it is laser inscribed with a certificate number. I consult with my colleagues in the office about the color and clarity. More eyes are always better on a diamond! I weigh and measure the diamond several times to see the table, depth and dimensions. I weigh the setting of ring and figure out a price depending on the metal that was used and the going rate for that metal. If I’ve determined that your diamond is something that I want to buy, I contact you with a price. Remember what you paid for your stone and what I offer you will be very different, because retail and resale are very different. Also, if your diamond was insured or has an appraisal on it, the price that I am going to offer will also be different because insurance and appraisals do not reflect a resale value, unless you have asked your appraiser to specifically give you a resale market value of your stone. There is no question that most people expect way more when they ask me what their diamonds are worth, and often they will say ‘thanks, but no thanks’, and I understand the disappointment because when you bought the stone a lot of money was spent, so I encourage everyone to shop their goods around and see where you can get the most money. I will always give you an honest answer and give you the most that I can for your diamond.